I'm thinking of buying a 220D from Canada. The seedo/odometer is in KMs so I think it may be a Euro or gray market car. Anybody have experiences, good or bad, w/Euros whey want to share? I've heard some shops say to stay away because of parts confusion w/US models. Others say they're better than US models. Thanks. First of all, I thought all cars in Canada have Metric instruments, at leas the speedometer. Secondly I have two Euro 240D's. One is a parts car and the other I have put over a half million miles on. I really see not much difference from a practical standpoint, since most of the Euros were changed over to some degree when brought in. My '84 had US lights when I got it and never got Euros until I got the parts car with them on it. Other than the far superior headlights, the other differences are for the most part, cosmetic. My mechanic sees a lot of Euro cars, including a 123 gas fired station wagon, some Euro SL's, and Euro 126 cars. He's only complained once or twice about the dealer giving him a hard time about a few parts like a guage cluster. Otherwise, he has no complaints. I have a Euro and non Euros and like Larry says "not much difference from a practical standpoint except for the headlights" I installed the round euro lights in the US car and now both are good night drivers. The Euro 240Ds do not have oil coolers which has not been a problem for the folks like Larry in warm parts of the country and its one less thing to leak. Didn't think the U.S. 240D's have oil coolers either - only the turbo engines have them... ? Yes, every US 240D that I've seen had an oil cooler. The lack of oil cooler never seemed to present a problem for me. But, I change my oil quite often. 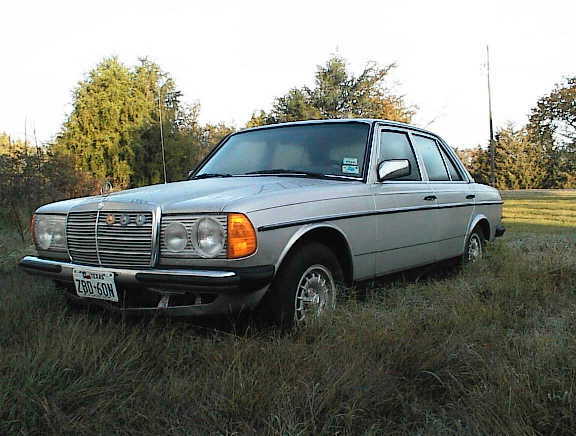 my '80' 240d parts car shows no sign of ever being a euro car, MB tex, bumpers, etc but it does not have an oil cooler and the records show it was purchased new in Seattle. This would be the only one I have ever heard of that was a US car not equipped with an oil cooler. Of course someone like me could have changed it but the oil filter housing does not have fittings, coulda changed that too, I guess. I gotta admit, I like the euro best except for the seats, cant beat that MB Tex, hopping into the euro with work cloths on doesn't get it. The cloth upholstery in my 240D has been incredibly durable. There is a small worn place on the side bolster at the drivers door. The problem is getting matching material. Even with cloth, mine is one of the fanciest Euro I've seen. Mine has wood trim, and a right side adjustable mirror, something I haven't seen in other Euros. Larry's right. Canada switched to metric more than a decade ago so this car may have been converted to KPH by a prior owner who was tired of doing the MPH to KPH conversion. It may still be more Euro than US though because the Canadian Regs. are a lot more liberal than US so foreign manufacturers didn't always install all the expensive US required stuff for Canada (airbags for instance) until/unless they were required in Canada. as to the seats. I think the euro seats would be more to my liking if they were darker. That cream, I guess it is, shows allot, but a good cleaning and applications of Scotch Guard helped. I am not complaining as I love both these cars. I gota apologies for the crappy pic, a newer camera is on the Xmas list. BEAUTIFUL euro 240D, stevo! Look me up if you ever sell it!